To continue exploring the history of cave diver navigational markers I now turn to non-directional markers. The non-directional marker is a crucial part of every cave divers’ navigational kit. This article will discuss the history of the non-directional marker, the history of the ‘cookie’ and its’ development into the common, readily available version that we see today. Daniel Riordan is a highly experienced cave diver, explorer, and instructor. 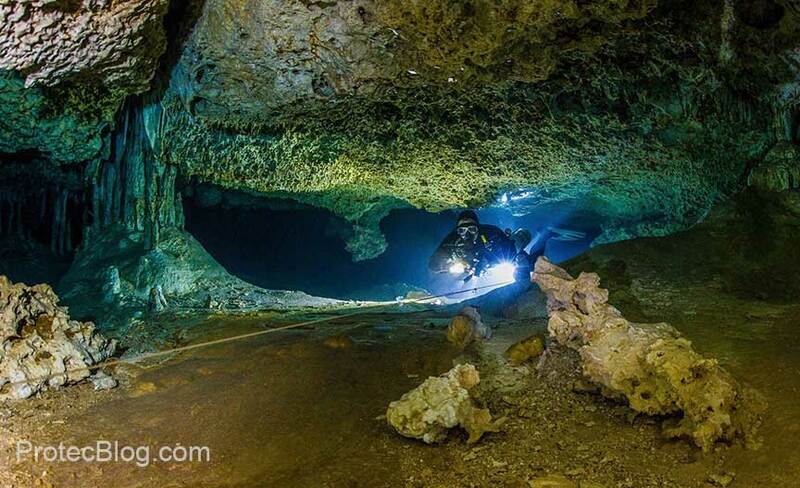 A cave diver since 1992, and instructor since 1996 with experience teaching in a wide range of locations outside of Mexico. He has also been involved in the exploration of many cave systems here in Mexico for over twenty years! We met and discussed one of his contributions to making cave diving safer, the cookie. In the 1990s most cave divers used clothespins as non-directional markers. However, the clothespin, often wood with a cheap non-stainless steal spring, tend not to be very durable. After some time in the water the wood warps and the springs rust. When training students to ‘read’ line and on simulated blind exits Daniel found that clothespins were not durable enough and tended to break or fall from the line – defeating their purpose. Similarly, when setting up for longer exploration dives where markers were left in the cave for weeks (before work commitments allowed for time to complete dives or check leads) Daniel would often return to find markers missing as they fell off the line leaving sometimes only a rusty spring on the floor. As well as using the clothespin as a non-directional marker, some European cave divers used semi-flexible plastic rectangles that could be slotted onto the line as station markers. When the one corner of these was cut off they were also used as directional markers. However, there was no way to lock these markers in place, which could result in similar problems of markers falling from the lines. Riordan began to experiment with other options for non-directional markers that would be durable, stay on the line and be able to take a beating during training dives. In 1997 while working at a dive shop in Akumal a solution was found. The shop had a large collection of recreation regulators and on the submersible pressure gauges, there was a console space for a compass. Initially the gauges did not come with compasses; instead, a blank, white plastic disc was fitted in the consoles. When the dive shop later installed compasses on their consoles, the discs were set aside. Riordan began to use these discs, experimenting with cutting different slots into them to find a position that would allow them to stay in place on the line. These were the first generation of cookies. Once Riordan had a working design other materials were tested. He bought PVC sheets, cut it into circles with a skill saw and added slots with a hacksaw. Due to the material, this design was positively buoyant. The next generation of the cookie came after one of Riordan’s students offered to machine cut some. Designs were drawn up in a computer program and cut-using laser cutter. This design was able to be made in bulk and came in yellow and white. Riordan sold these off to friends and other local divers within days of receiving them. Many divers liked the idea of having a marker that could rely on to be where they left it when they returned! In 1998 Dive Rite purchased the idea and design of the cookie. They began to commercially manufacture and sell the cookie for divers everywhere. Since then there has been many variations and different designs using different methods of production and materials, such as injection molds. Halcyon’s smaller cookies, Apeks are two different examples of these variations. However, Riordan still holds that the original size and shape are his preferred. From clothespins to a number of options for non-directional markers, dive gear has and will continue to evolve. The cookie was an innovative solution to a problem that was compromising diver safety, exploration and training. The development of the cookie occurred when there was a lack of viable alternatives and was driven by ingenuity. Next time you see one on a line (or go to drop one of your own) have a think what it would be like to dive without one!